This is my daughter and her friend. But it could be my Mom and Dad. Or my husband and myself. My guess is there are lots of relationships that mirror these photos. I love the range of expressions on these two. It’s more fun the longer I look at them. What in the heck is she doing? Getting my groove on. Clearly. Life is for DANCIN! If I stand here very calmly maybe they won’t think I know her. They said to smile. I’m smiling! Ok. I’m leaning away. Moving slightly to the side. You can’t ignore me!! I’m smiling! I’m here! Talk to me! She’s kind of fun. Do NOT tell anyone I thought that. My three year old is taking swimming lessons at the local YMCA. I love this pool. All kinds of people. All levels of skill. The past two Saturday mornings I’ve hauled out of bed earlier than I like on Saturdays and my girls and I have gone down to the Y. The little one is learning how to blow bubbles in the water and alligator crawl across the pool. She’s holding onto floating barbells and kicking on the side of the pool. She keeps giving strange looks to the one little boy who is crying on the sideline. The little miss is easy to read. Hope his parents aren’t watching. She’s not subtle. Her big sister is swimming laps over in the lap pool. She had to take a test to qualify to swim in the deep water. She was nervous. She passed. Down and back. Kick. Straight. Down and back. This week I sat on the sideline in one of those plastic stackable chairs. The chair had a crack along the back. Whenever I leaned back I fell slowly back through the chair. I would try for good posture sitting. I’d forget. Fall back though the back of the chair. Disconcerting. My baby was kicking and splashing. My big one was tunneling through laps. Down and Back. I was watching both of them and surprising myself repeatedly with the strange bendable plastic chair. Good way to spend 30 minutes on a Saturday morning. Made me think. Swimming lessons are fun. Splashing around in the shallow end certainly gets us used to the water. Get the feel for things. Safe and secure. Lots of eyes watching. Minimal risk. Lap swimming in the deep water lanes is harder. Better at building muscle though. Still plenty of life guards. Some of you know that I’m working on a new venture. I’m launching a new blog called Quirky Faith. I’ve got a new website, email subscription software, photo shoot and a PO Box all lined up. I’ve got some guest bloggers and some give aways. I’m calendered up. Right this very second I feel like I’ve graduated from the kiddie pool and swum past the lap pool. I feel like I’m standing on the cliff above the ocean like one of those deep water ocean divers. Peering down 100 feet to deep water. Wondering what is under the water and what is out past the horizon. The ocean is deep. Mark Batterson says that if your dream doesn’t scare you it isn’t big enough. I’m terrified. And very excited. Scarecited. www.QuirkyFaith.com launches on July 1st. Twenty Days. Swim Baby. It occurred to me a few days ago that if I keep writing I might run out of things to talk about. Hasn’t happened yet in 40 years but you never know. I heard this song for the first time on Sunday morning at church. The worship band was rocking out. Well. We were Nazarene style church rocking. Not Metallica concert rocking. At any rate. This song Love Come Down by North Point has been stuck in my head all week. Listen Here. What struck me about this song was the joy and fun – and this line about singing forever. It encouraged my soul. Music has a way of reminding me of what matters. I took a walk this past weekend. Nice big training five-mile walk. My pace stunk because I kept stopping to take photos. This one made me want to write. Or paint. Or sing. Blue and green and white and good lines. Nice composition there oh Creator of my soul. I love watching friends help friends. I love watching kids succeed at piano or spelling or soccer or picking up their socks. Popsicles on sunny days. Planting a garden. Finishing a book. Watching the movie. I’m inspired by forgiveness. I will never run out of things to talk about because Grace never runs out. I’ve had a day. Or two. The kind of hang your head, kick the tires, sigh and eat chocolate chip cookie kind of days. The “I know I’m a better mom, better wife, better boss than this” kind of days. The “I promise to floss, I promise to ask, the I promise to wait” kind of days. At one point yesterday I was actually telling my children to stuff the garbage sitting around in our car under the seat so that the people we were picking up wouldn’t see it. Can I just say I have garbage and you can see it and hiding it doesn’t make it go away and that my dear children its just fine if people see our flaws. But right now I’m tired of the pointless could have, should have self talk. So I’m going to do what generally works. I’m putting on some music and I’m making a list. Even though I don’t feel like it. Here are the things I know to be true. I stand on them. I am loved by my Creator. Greatly. I am not perfect. It’s okay. My story is not the list of my failures and shortcomings and sin. It’s frankly also not the list of things I think I did right. My story is Grace. Feelings are not facts. Feelings are real. They are important. They are toxic when they are bottled up. But they are NOT facts. I don’t know what the future holds but God does. He promises it’s secure. My daughter was in the office yesterday morning with me before my day headed south. I found this artwork this afternoon in a stack of paperwork. It reminds me that I often miss the joy in my life in the midst of the junk. And this blue haired wonder made me smile and remember that my husband is courageous and kind and that my ten year old is determined and fun and that my three year old is passionate and clearly a budding artist. It made me remember to count my blessings. Gratitude trumps grumpy. That is what I know. My daughters and I went to the library yesterday. I always do this with a little trepidation. I’m not worried about the content of the books. I can filter for my kids until they are old enough to discern for themselves. Frankly I worry much more about the filters on our electronic devices. I love the library. One of my happiest mom moments was when my eldest got her own library card. (Read here). My youngest is getting close to the requirement of writing her own name. Her big day is coming. So it’s not lack of love for the library that concerns me. I’m worried I’ll lose or damage the books I take home. I have life management problems. By the grace of God we have been able to go through some big deal parts of life. But goodness do the details fly crazy. One time I lost a library book. Searched like crazy. Paid for said book. Found book under my car seat. Apparently I lost that one on the way home. It. Never. Even. Made. The. House. I’ve dropped them in the tub. Ripped pages. Spilled coffee. Actually technically I didn’t spill the coffee…. Anyway. We went to the library. Daughter one checked out a couple of books on the Battle for the Books list. She’s trying to get ahead for next year’s contest. Daughter two checked out a new book by Henkes called “Waiting”. It’s gorgeous. She also checked out a chapter book with no pictures. I’m not totally sure why since she can’t read but she’s been carrying it around all day making her cousin and sister and auntie and I listen to what it says. Maybe I’m wrong. Maybe she can read. She runs her finger through the pages looking for the letters she knows. And I brought home the best book ever. I am such a nerd that I got a third of the way through it, decided I must own it and bought a copy for my Kindle. 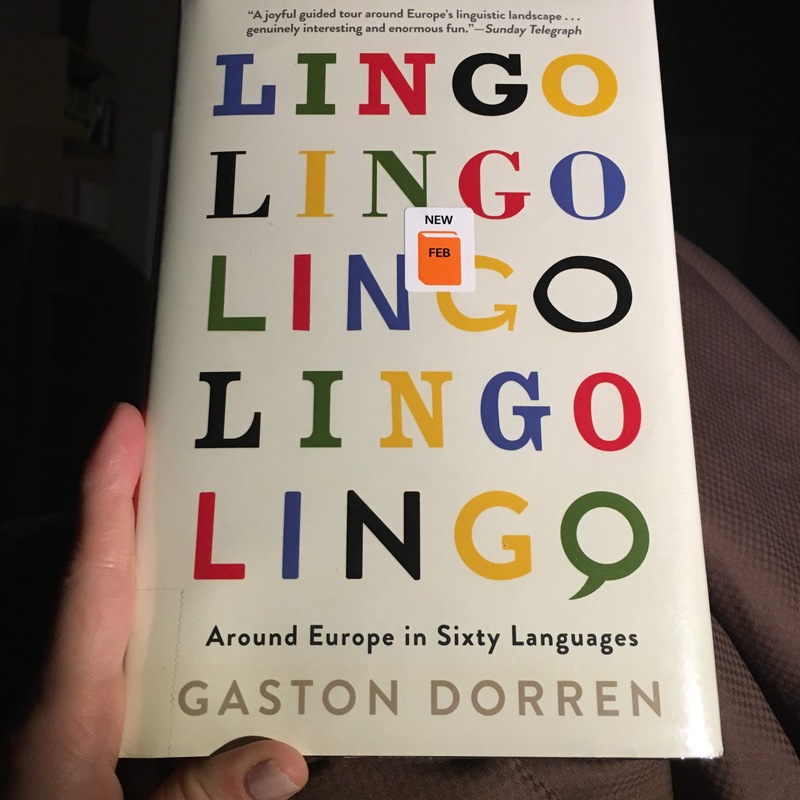 My new book is called Lingo by Gaston Dorren. Around Europe in sixty languages. ﻿Told you I was a nerd. My grandfather was a linguist. The love of the written word must have a genetic marker because this book about languages and words and the wisdom and why of what we say and what we write is making me grin. Omenie: A Romanian word for the virtue of being fully human, that is: gentle, decent, respectful, hospitable, honest and polite. I love this. Someone should name their daughter this. I want this word in my obituary someday. I hope my life earns it. Goennen: German for the exact opposite of ‘to envy’: to be gladdened by someone else’s fortune. I want this word! We need this word! 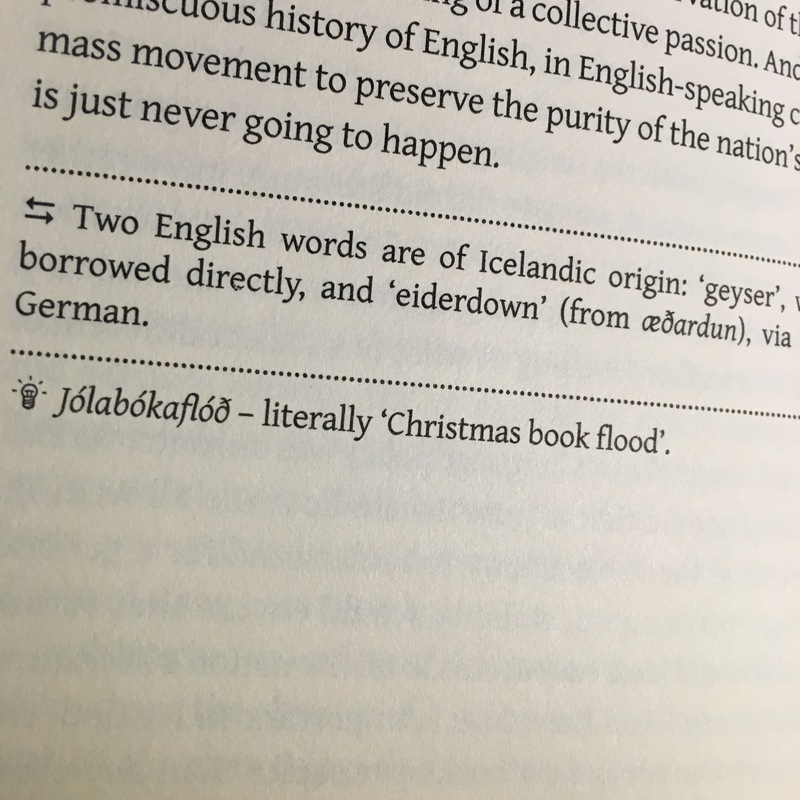 Jolabokafloo: Icelandic. Christmas book flood. This happens at my house. The Christmas morning joy of a stack of books. Fun and fun and fun. English apparently needs more versions of the letter O as well. So I wrote this blog mostly to tell my mom and sister and aunts and uncles and cousins on my mother’s side that you may also love this book. It’s speaking our language. Er. Languages. Anyone else? Thinking about words tonight had me awake in the middle of the night last night pondering. Do you know that I love how God is described in the Bible? The Alpha and Omega. It’s the beginning and ending of the alphabet. I’ve always been told it refers to God’s totality. And Jesus is called the living Word. In the beginning was the word and the word was with God and was God. I love that it’s through language that God meets us and it’s through language that He made us. And it’s letters and words and sentences that I run my fingers through and underline and circle to try and understand my place. I look for meaning just as my three year old does in her chapter book. I love the library. Hope I don’t lose any books this time. Life and meaning wrapped in words. I wish you a merry Jolabokafloo. Oh my church family. I’m just going to put this here because I can’t hug you all the morning. I’m sure you heard our building was attacked last night. Fire. Arson. Thank Jesus for sprinklers. Water damage. Thankful no one was hurt. “For I consider that the sufferings of this present time are not worthy to be compared with the glory that is to be revealed to us. So dear family. Don’t forget the truth that the arsonist does not know. The church is not the building. May we shine brightly. Love you. Have you read the viral article about how broccoli is bad for you? The author claims that “Broccoli is bad for you, like, really toxic bad”. I bet you didn’t. I didn’t at first either. I skipped ahead and read the comments and realized something was fishy and went back and read some of the article. Still didn’t understand the point. Dragged myself through the whole article and realized that I’m the one who is a mess! The entire point of his article was that people are um….idiots might be too strong a word…..how about misguided…. and the unwise readers form health ideas simply from reading the headline or maybe the first paragraph of online posts. I love this article. I laughed enough at the comments section that I friended the author on Facebook (along with 20,000 other people). Funny guy. After I finished laughing, it also made me worry about our society. These people live amongst us. I’m one of the guilty ones. What really hit me though was not that judging articles based on headlines can make you look foolish or commit you to unwise life changes. What made me think is that I also can get caught up in assuming I know people based on their personal headlines. Think through this list. What do you assume you know based on these demographics? My guess is that people’s stories are more complicated and more important than their headlines. I know I don’t like it when people assume they know me because they know my demographics. I made myself a little list of online rules for reading articles. Funny thing is they work well with people too. Don’t post anything in a comment section until you’ve read the whole article. Nothing at all. (See how this works…unsolicited and uninformed advice is painful – not helpful). Don’t post anything mean in comments sections. (Nice matters in real life too). Don’t commit to life change without running your new idea through Snoopes. Or in my case – my husband – he has an uncanny ability to sniff out scams. (Don’t change your action towards anyone based on gossip). Check your source. The Onion is fake. (So is most of what you see on Instagram or Facebook. At the very least its just a highlights reel. People’s real lives have more joy and more pain than shows up online). Do you have anymore online filter rules? Do they work with people? How about with Broccoli?